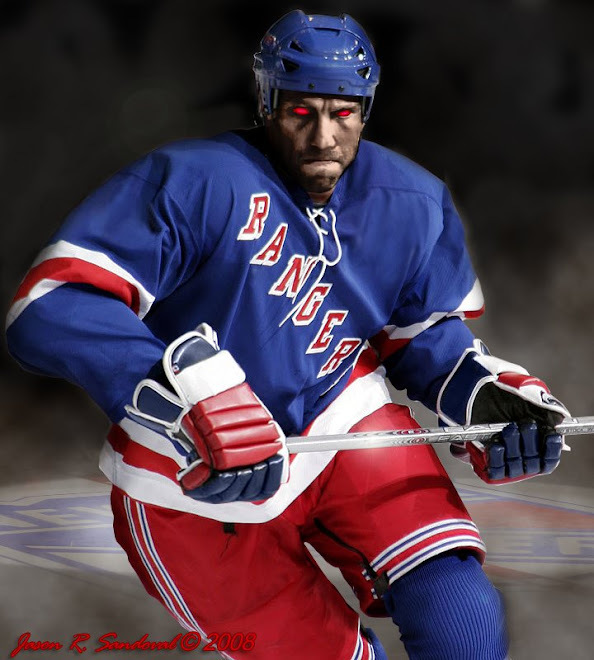 Last night at the Garden, the Rangers unveiled their new third jerseys -- to be worn on Sundays and against Original Six teams. For the coming out party for the jerseys, the Rangers hosted the Boston Bruins. I have to admit that when I first saw them (the jerseys) during the offseason (modeled by Sean Avery), I was unimpressed. However, after seeing some pictures of the jerseys posted by friends over the weekend from the Rangers' introduction of the jerseys and watching the game on t.v. last night, they really grew on me. As for the game, it was another nail-biting, closely-contested, low-scoring game that has been the trademark of their encounters the past 3 seasons. This time, Tim Thomas led the Bruins to a 3-2 victory over Henrik Lundqvist and the Rangers. The game was played briskly like an old-time pitcher's duel. When the final horn sounded, the clock read 9:22 so it took only about 2 hours and 15 minutes to play the entire game. The season series is now tied at 1. The official recap is here. Coming off the heels of their scintillating overtime victory in Pittsburgh, the Rangers would have been excused if they came out flat or were beaten by the Bruins, who brought a 9-4-1 record to New York. Thomas, rejuvenated after last year's mediocre season, arrived with a gaudy 9-1-0 record and a sterling 1.32 goals against average. Coming into the game, the Bruins had allowed a paltry 29 goals through their first 15 games. and with his body. Here, Tim Thomas keeps the puck out and lets Marian slide on by. Meanwhile, his counterpart, Ranger goalie Henrik Lundqvist had a 2.60 goal against average, which some detractors might remark includes a 1.33 soft goal allowed per game average. Unfortunately in this contest, the difference was the fact that Lundqvist's Achilles heels (one for each ankle) appeared. First, he was beaten high over his shoulder while down on the ice by Tyler Seguin to give the Bruins the lead at 2-1 with 3:25 left in the second period. Later, he let in a soft goal in the first 70 seconds of the 3rd period by failing to cover the post securely permitting Mark Recchi's shot to find the space between his leg and the post to dribble its way through for what turned out to be the game-winning goal. difference as the Bruins jumped out to a 3-1 early in the 3rd period. 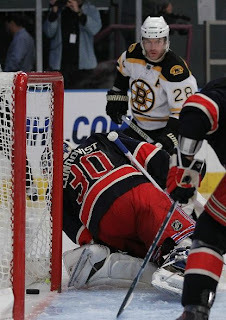 Last night, the Rangers started fast and maintained a decent amount of pressure on the Bruins all game long. Tim Thomas was kept busy but he did not have to stand on his head to keep the Rangers at bay.The Rangers showed some offensive fludity at times as Gaborik and his linemates continued to grow more comfortable. What was definitely encouraging was Brandon Dubinsky's powerplay goal to give the Rangers a 1-0 lead with 7:10 gone in the second period. He deked Tim Thomas with his eyes as he charged into the offensive zone. Thomas bought the fake (which was legitimate since Gaborik was coming down the center) and moved slightly to his left before Dubinsky beat him with a wrist shot. Dubinsky's play has shown no let up since Gaborik has returned as evidenced by the artistry of the game-winning play in overtime against Pittsburgh and his goal against Boston. The Rangers have developed two quality scoring lines. For all the worries about a lack of offense, the Rangers are 10th in the NHL in goals scored (57), rarefied air for this team in recent years. During the game Derek Stepan's presence became more pronounced as he logged more than 11 minutes for the game (including 3:30 on the power play) at the expense of Eric Christensen. It appears that Coach Tortorella is giving Stepan an opportunity to work his way on to the first line. His pass to Gaborik for the Rangers' 2nd goal was simply beautiful and unlike Christensen's ill-conceived pass in the 1st period, the correct decision. Thanks to the recent spate of games at home, Stepan certainly looked more comfortable playing before the home crowd. During recent games, I noticed his ability to fend off defenders around the boards and behind the net in addition to his overall speed and skating skills. The Rangers even outshot Boston 36-20 for the game including a margin of 16-5 in the final period. However, the Bruins provided a clinic for crowding the slot and blocking activity in the creases while blocking numerous shots, successfully frustrating the Blue Shirts and providing ample protection for their goalie. Building on recent success, the Rangers killed all 3 of the Bruin power play opportunities (extending their recent success streak to 17 straight and 23 out of 24). This success with the penalty kill takes pressure off the team from worrying about incurring penalties by being physical. This is a far cry from their rate of nearly 25% futility rate that put them near the bottom of the league for the first month of the season. Also noteworthy is the fact that during the past 7 games (excluding the 5-3 loss to the Caps), the Rangers have given up only 11 goals without Michal Roszival in the past 4 games, and with a blueline dependent on Steve Eminger and Michael Sauer (both continue to improve) as well as the noticeably improved Marc Staal and Dan Girardi. The goals allowed (52) now puts them in the middle of the league, which is far better than where they were at the beginning of November. The Rangers had plenty of chances that were squandered during the game. Early in the game, Eric Christensen ruined a 2-on-1 break by trying an extra pass to Marian Gaborik instead of shooting. Michael Del Zotto took a slapshot from the left point with Ryan Callahan in front of Thomas. The puck was just a bit too high and Callahan whiffed on the deflection try. In the second period, the Rangers had a 4 minute power play which ended up looking a lot like the Rangers were interested in running out the clock or forgetting that during a double minor, you can score more than one goal. Unfortunately, this opportunity was wasted. In the final period -- the most painful 20 minutes of the game, the Rangers fell behind early 3-1 before Marian Gaborik brought the Rangers closer with a beautiful passing play with Derek Stepan with 14 1/2 minutes remaining. The Rangers could not break through for the equalizer as the Bruins tightened up their defense. What was most frustrating was the Rangers inability to exploit a lengthy 2 man advantage when Andrew Ference and Zdeno Charra were whistled off within 16 seconds of each other with less than 6 minutes to go. While the puck movement was decent and the Rangers did take some shots, they made lives too easy for the Bruins. The Rangers continue to show a tendency to have their defensemen creep in too closely from the blue line. That gave the Bruin defenders less ice to cover, preserving their strength, and enabling them to bottle up the slot and crease. The Rangers failed to open up the triangle to make the Bruins cover larger expanses to chase down the Rangers. This has been going on for the past 2 seasons at least and essentially neutralizes the 2 mad advantage. Still, the past 2 games -- in Pittsburgh and against Boston -- have had playoff atmospheres and the tight-checking, physical play and gut wrenching twists and turns that we see every Spring. The Rangers are proving they can compete with upper echelon teams and bring a full-game effort for nearly every game. The Rangers are now off to face two quality Northwest Division teams: Colorado (10-7-1) on Friday night and the Minnesota Wild (9-6-2) on Saturday night. Both are having good seasons so far so they should be fun games as the Rangers have a great 6-2 road record.